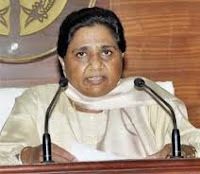 Uttar Pradesh Chief Minister Mayawati on Wednesday tendered her resignation to Governor B L Joshi after facing a rout in the assembly elections. The chief minister, apparently to avoid waiting news persons, chose to arrive from the back door of the Raj Bhawan. Mayawati's BSP faced a rout in the assembly elections managing to win only 80 seats. Her party had won 206 seats in the 2007 assembly elections.